On the last day of March this year, I set out to pass judgement on all one hundred and fifty-six of the new Pokémon of Black and White. 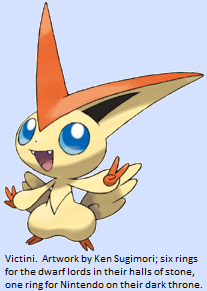 I have spent the intervening nine months whining constantly about the general incompetence of Game Freak’s designers and the total unworthiness of the name “Pokémon” of such creations as Unfezant, Emolga, and (shudder) Garbodor. So, here’s the big question: what’s the final score? And shaken my head in confusion and given up on one. All right! One hundred and fifty-five down, one to go! I can do this! Yeah! Go me! I’m awesome! Now, let’s wrap this up, with Unova’s last remaining legendary Pokémon: the glacial Dragon-type Kyurem! …I can’t believe this; they did it. They actually did it. They actually recycled Mewtwo’s backstory! The fiends! 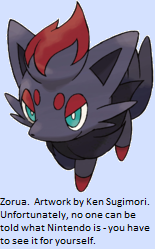 I’m back from Italy and on the home stretch, with only three more Pokémon to go, so let’s check out today’s, the second of three Pokémon that still don’t officially exist according to Nintendo (and therefore have no official art; the pictures I’m using here are by Xous54 and are closely based on the in-game sprites): the enigmatic Meloetta. Today I’m looking at the second of Black and White’s legendary trios, the ogre-like genies Tornadus, Thundurus and Landorus. Why do these games have so many legendary Pokémon, anyway? Every set of games always introduces more of the things than the last (compare five in Red and Blue to thirteen in Black and White), and at some point you have to wonder how many we actually need… but I should judge them all on their merits, shouldn’t I? 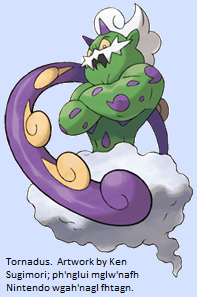 So, without further ado: the legendary genies, Tornadus, Thundurus and Landorus.